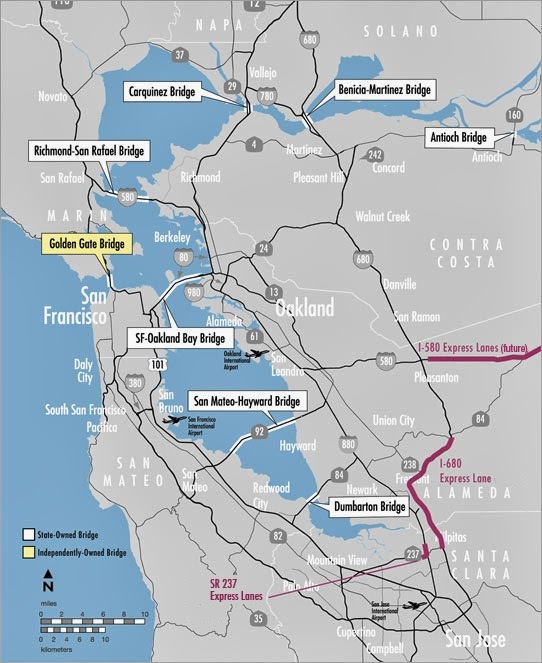 Like the other San Francisco Bay toll bridges the Richmond-San Rafael Bridge is named after the two cities it connects. It's the northernmost of the bay toll bridges and when it was built in 1956 it was the world's longest bridge at 5.5 miles. I took the photo above (and for a previous blog) many years ago with a film camera. The bridge looks slightly different today because it was retrofit in 2001. The Richmond-San Rafael Bridge is composed of two cantilever truss bridges with an odd sway-backed truss frame between them. It's similar to the old East Bay Bridge Crossing that was replaced last year, but the Richmond-San Rafael Bridge isn't a lifeline structure and so it was easier to retrofit to prevent collapse. Conta Costa County, California Bridges: Richmond-San Rafael Bridge across San Francisco Bay by Mark Yashinsky is licensed under a Creative Commons Attribution-NonCommercial-NoDerivatives 4.0 International License.